No, it's not the evil eye. It's a newly discovered "extrasolar planet." The red elliptical shape you see is essentially a dust ring created by the planet "Fomalhaut b" as it orbits its star. It takes Fomalhaut b a mere 872 earth-years for it to make one complete orbit around its parent star. 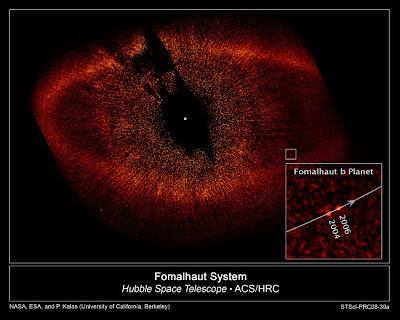 - Check out the images at HUBBLESITE.org: "Hubble Directly Observes Planet Orbiting Fomalhaut b"